Joan Rivers Gold-tone 18" Necklace. Joan Rivers Gold-tone Woven Hoop Faceted Bead. From Joan Rivers Classics Collection Accessories. From Joan Rivers Classics Collection(R) Accessories. A looped pattern traveling inside of a larger loop with Pink, Blue, and Dark Red beads beaming from within. Buy now beautiful signed Joan Rivers gold tone black ribbed lucite pendant matinee length necklace in very good wearable condition. A necklace to be noticed. Colossal color and plentiful gemstones create this show-stopping Joan Rivers necklace. Faceted, cabochon, transparent, translucent, and opaque beads create the dramatic look. Color your world. From the Joan Rivers Classics Collection. Includes pendant, seven simulated gemstones, necklace. Signed: Joan Rivers. Clasp: Hook. Condition: M int condition. From Joan Rivers Classics Collection(R) Accessories. Bead-accented extender chain. Pear-shaped bail accommodates most chains. Glitter and glam! Main Stone Drusy. Includes torsade style glass bead necklace and simulated drusy quartz enhancer. From the Joan Rivers Classics Collection. Main Stone Color Purple. Snap-hinge magnetic bail with round, bead-set crystals. From Joan Rivers Classics Collection Jewelry. New in Joan Rivers Box. It delights with chic shades including blue, green, pink, peach, and purple. 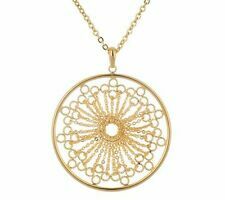 A large pendant is centered on the antiqued goldtone curb-link chain. From Joan Rivers Classics Collection(R). Style Jeweled Oval Pendant. Joan Rivers goldtone "Look of Gold" diamond shaped enhancer. A diamond-shaped enhancer with beaded fringe and clear crystals. From The Joan Rivers Classic Collection. Joan Rivers Box. It was sold as part of the Joan Rivers Classics Collection. The chain can be changed between a 36" single strand and a 18" double strand. Like new condition. 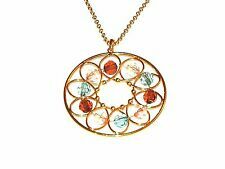 QVC Joan Rivers Necklace Two Tone Changeable 7 Color Pendant With 18"
Color your world. From the Joan Rivers Classics Collection(R). Joan Rivers Box. Includes pendant, seven simulated gemstones, necklace, and instructions. QVC Joan Rivers Necklace & Earrings Set Omega Simulated Drusy Pendant on 18"
Simulated drusy quartz on pendant; simulated drusy quartz drop earrings. Match made in heaven. This earrings and necklace set is perfectly paired for easy accessorizing. Enjoy the celestial sparkle of drusy quartz. From Joan Rivers Classics Collection Jewelry. New in Joan Rivers Box. A celebration of color and light, this wondrous wardrobe includes 18" chain and pendant with ten interchangeable crystals in sparkling simulated sapphire shades of fire orange, yellow, mint green, pink, purple, peach, blue, clear, gray, and honey brown. Wrapped in chic goldtone chain, a simulated gemstone nugget dangles enticingly from a rolo link chain to form this pendant. From the Joan Rivers Classics Collection(R). Joan Rivers Box, pouch, romance card. It delights with chic shades including blue, green, pink, peach, and purple. A large pendant is centered on the antiqued goldtone curb-link chain. From Joan Rivers Classics Collection(R). It all depends on the local office. Graduate to new levels of style.This pendant features three levels of rings, graduating in size from top to bottom with an O-ring bail continuing the fluid design of the rings. From the Joan Rivers Classics Collection(R). Wrapped in chic goldtone chain, a simulated gemstone nugget dangles enticingly from a rolo link chain to form this pendant. From the Joan Rivers Classics Collection. Chain secures with a lobster claw clasp. Candy crush. You'll be super sweet wearing this candy-color pendant from the Joan Rivers Classics Collection. A cushion-shaped colored bead dangles tastefully from a fine oval link chain for a look that will satisfy your stylish sweet tooth. Color your world. From the Joan Rivers Classics Collection.Two-tone. Includes pendant, seven simulated gemstones, necklace. If the information does not match, your order may be canceled. So better communicate for faster resolution to any disputes. Wrapped in chic goldtone chain, a simulated gemstone nugget dangles enticingly from a rolo link chain to form this pendant. From the Joan Rivers Classics Collection. Bead accent at end of extender. Chain secures with a lobster claw clasp. It was sold as part of the Joan Rivers Classics Collection. The chain can be changed between a 36" single strand and a 18" double strand. As shown, the necklace remains new and unused. Color appearance may vary depending on your monitor settings. 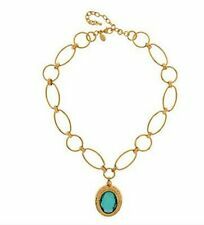 Joan Rivers Easy Elegance 18-1/2" Necklace w/ Oval Teal Blue Pendant Handcrafted Chain Goldtone. From the Joan Rivers Classics Collection. Necklace: combination of bold oval and round links. Includes necklace and pendant.